Dramm is please to announce our new FC3X7 FertiCart. 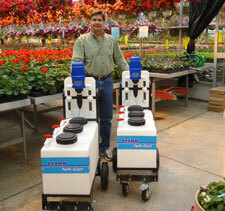 The new FertiCart has three separate 7 gallon tanks for three different stock solutions on one fertilizer injector cart. The FC3X7 is made to work with the Dosatron D14 Injector and comes complete with all of the plumbing needed to use the injector and meet Dosatron's warranty requirements. The FertiCart includes unions on either side of the injector, a 200 mesh filter, and a check valve for back flow prevention all within a sturdy steel frame. Each tank is plumbed with an isolation valve to allow for quick switching of fertilizer solutions. Each tank has a drain valve underneath for easy cleanup. For more information about the FC3X7, email us or contact us at the numbers to the left.